Hojbjerg: "I had to pinch myself"
Munich - When Pierre Hojbjerg came on in the 71st minute of FC Bayern Munich's 4-0 win at home to 1. FC Nuremberg on Saturday, the Dane became the youngest player in the club's history to appear in the Bundesliga. Question:Pierre Hojbjerg, you just played your first 19 minutes of Bundesliga football. How do you feel? Pierre Hojbjerg: It's incredible! It's been my dream ever since I was little. I had to pinch myself, but it's real. When I came on I needed one or two minutes, maybe even five, until I got into the game. I almost peed myself (laughs), but I think any 17-year-old would probably be the same. It was a fantastic experience. Question:Manuel Neuer whispered something in your ear just before you were brought on. What did he say to you? Hojbjerg: I've honestly forgotten, I was so nervous. I can't remember the first few minutes (laughs). Afterwards I had two or three good touches and that helped me settle down. I think he said something along the lines of: "Do your best, kid". It was just something to motivate me. Question: You joined Bayern a year ago. Was it the right decision to move to Munich from Brondby's U-17 team? Hojbjerg: Obviously yes. It's hard to believe how much Bayern have helped me develop as a player and as a person. Hojbjerg: My dad, my uncle and my advisors Sören and Kay Lerby. At home my whole family was cheering me on too. It was an incredible feeling and it gave me a lot of confidence. The team is also there for me and I feel at home in Munich and at Bayern. Everyone wants the best here and that's great. Question: Having actually played now, do you feel a bit like a Bundesliga champion too? Hojbjerg: I have to be careful what I say here...(laughs). I can at least say I was involved a bit. Frage: Now that you've made your debut, what's your next aim? 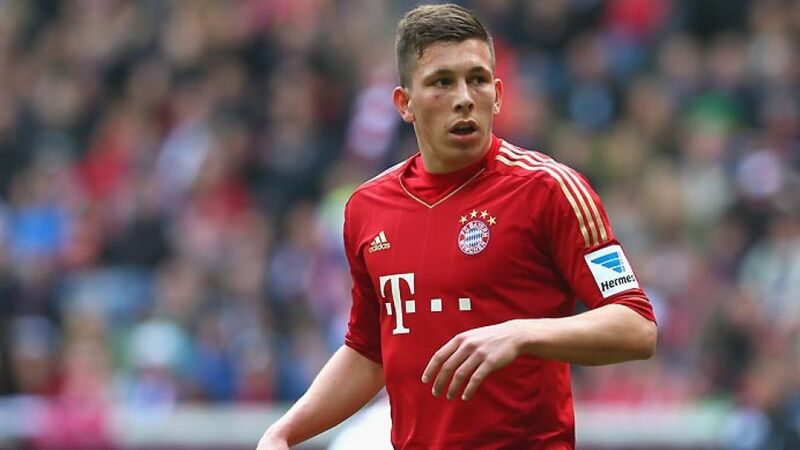 Hojbjerg: I'm staying calm and taking things one step at a time. It's important to keep your feet on the ground and not rush things. The next stage will come when I'm ready for it. The coach and his staff thought I was ready for my debut and we'll wait and see what the next step is and when. I work hard, but the most important thing is always to keep your feet on the ground. Question: Surely it can't hurt your chances that Pep Guardiola is arriving in the summer, a coach known for his faith in young players? Hojbjerg: I'm not thinking that far ahead. I'm just trying to learn as much as I can from Jupp Heynckes. He's a fantastic coach. The way he treats all the players, young and old, as well as everyone else is exemplary.